Oh wait. 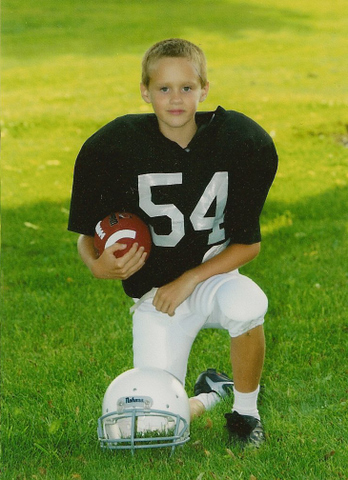 You aren’t supposed to call football players adorable, are you? I’m feeling the need for a contest here. NO particular reason. Just because. To enter? Post your guess as to which kid is which. Even if you really have no clue, just post a random guess. One is named Joe, the other is Will. You can identify them in your comment by number. (In case you can’t read their shirts, 52 is on the left, 54 on the right). No fair guessing if you are related and know which one is which number. I guess if you are related and you DON’T know, it’s fair for you to guess, but I’m not promising I’ll enter you in the prize drawing. Entries will be accepted until Friday at 5PM CST. Entry to be drawn at random. Prize to be determined, either something quilty, yarn-y, or…something else if you don’t quilt or like yarn. And you are welcome to invite your friends to guess, too. Or not, if you think it’ll improve your chances of winning. edited October 3, 2008: the contest is now closed, you can read the answer in this post. Thanks for playing along! Will is number 52, Joe is 54. I’m cheating, though, squinting to look for a significant mole. I will say Will is 52 and Joe is 54, and I am a regular blog reader here! I think Will is 54 and Joe is 52. Or the average of Joe and Will is 53, but then you’ll have to call them Jill or Woe. I even went back through 6 months of posts looking for something, ANYTHING that would help tell them apart. They are significantly different in face shape. Yes, I am a teacher. I spend all year trying to remember kids’ names. I had one set of identical twins one year who I would watch come into the room, see where they sat, and memorize the hair style (they were girls) so I would know who was who. Will is #52 & Joe is #54. They’re tough to tell apart. Worse than some identical girls I knew when they were that age…. 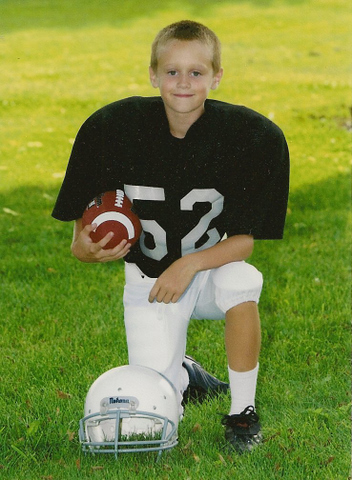 I’m voting Will #52, Joe #54…my son was #52 while he played football. He was the starting center 7th & 8th grade, but gave it all up for golf when he was a freshman. is will 52 and joe 54? who cares…they ARE adorable. pssst..don’t tell them i said so. I saw them on TV this morning! The local weatherman went to their school yesterday. Thank goodness they were right in the middle of the photo with a tall girl in-between or I would have missed them. Hokay…. lemme give this a whirl… how about alphabetical order? Joe is number 52, Will is number 54. I really have no idea they are both very handsome. What little stud-muffins! My guess is Will-54, Joe-52. You’re going to be in big trouble when they hit puberty! So handsome. My kiddo is Number 8 and the tallest on his team – easy to pick out – Good luck!! Fric on the left and Frac on the right. But hey, they are cutie pies! Gah! You have twins. Don’t do this to us. 😀 I liked the Jill and Woe comment though. Handsome boys!!! Let me guess… one of them is Joe and one is Will. Close enough? I am a regular reader of your blog, and you have been tagged! Please visit this blog post to learn what to do. What a sneaky way to get people to write to you. My guess is the Joe is 52 and Will is 54. I cheated too trying to confirm my initial guess – I searched your blog. Will is 52 and Joe is 54 although I originally thought the opposite. Will is # 52 and Joe is # 54. They look so handsome in their football uniforms! Let’s see…my guess is Joe (52) and Will (54). At first I thought Joe is on the left and Will on the right. Now I think it’s Will (52) on the left and Joe (54) on the right. You should be a proud momma!! Man, those boys are going to break some hearts! Adorable!